Description: New original Liteon laptop ac adapter charger. This 90 watt adapter comes with a power cord. 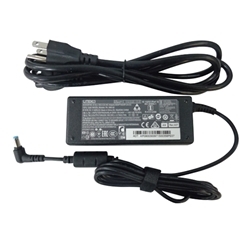 Input: 100-240V~1.5A, Output: 19V 4.74A, Watts: 90 W. This can be used with select Acer, eMachines and Gateway laptops only! Compatible Part #'s: AP.09003.025, KP.09003.004, PA-1900-32AH, KP.09003.009, PA-1900-32AW, KP.09001.003, ADP-90MD HBA. Acer Aspire E5-572, E5-572G, E5-575, E5-575G, E5-575T, E5-575TG, E5-772, E5-772G, E5-773, E5-773G, E5-774, E5-774G, F5-573, F5-573G, F5-573T, F5-771, F5-771G, U5-710, XC-704, XC-704G, Z1-623, Z3-705, Z3-705G, Z3-710, Z3-715. Acer TravelMate 6495, 6495T, 6495TG, 6595, 6595G, 6595T, 6595TG, 8473T, 8473TG, 8573, 8573G, 8573T, 8573TG, P278-M, P-278MG, P643-M, P643-MG, P-643-V, P653-M, P653-MG, P653-V.